A sea-view villa with infinity pool close to beaches and Gaios Town. Armonia combines charm and practicality in equal measure to create a very liveable and welcoming environment. 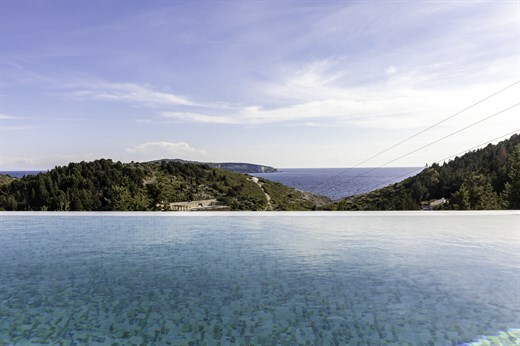 Wonderful panoramas of the sheltered bay and peninsula of Mongonissi, the sea and Antipaxos add a sprinkling of magic, while the splendid infinity pool will have you wondering whether it's really worth leaving your home from home to explore the idyllic beaches on the coast below. Inside: accommodation at Armonia is all on one floor. The main entrance takes one from the pool terrace into a well-laid out open-concept living and dining area with kitchen. A sofa and an armchair are positioned to make the most of the delightful sea views, lofty wood-beamed ceilings make for an airy atmosphere and the L-shaped kitchen serves the adjacent dining table with the minimum of fuss, The two bedrooms, a double and a double-twin, are situated on either side of the living area, Each has its own en-suite shower room, views out to sea and access via glass doors to the pool terrace. Outside: both the central living area and the bedrooms spill out onto a long terrace that runs along the front of the property. At the centre is the wonderful infinity pool, offering beguiling views out to sea. At one end, a mature tree provides shade for a comfy double day bed (the perfect spot for an afternoon snooze), while at the other, a panoramic, covered dining area, served by a in-built stone barbecue, makes long al fresco meals an irresistible proposition. Armonia features a fantastic infinity pool, offering swimmers stunning views while in the pool. There is a drop from the infinity edge so we recommend children are supervised at all times. Please refer to our general safety page if you would like more information about infinity pools. The last part of the access road to Armonia is quite rough so we recommend guests hire a 4x4 car or at least one with high clearance. For guests arriving in Corfu on a morning flight, a taxi transfer from Corfu Airport to Corfu New Port and the hydrofoil crossing from Corfu New Port to Gaios on Paxos are included in the rental fee for clients staying at Armonia. If your flight arrives in Corfu in the afternoon/evening after the last hydrofoil has left, a taxi from Corfu Airport to Corfu New Port is included, but a private sea taxi is not (however, we would be happy to organise for you). In this case, the return leg from Gaios harbour on Paxos to Corfu Airport for your flight home is of course still included. Due to the relatively limited number of hydrofoil/ferry connections between Corfu and Paxos in the shoulder seasons, if you are travelling outside July or August, we recommend you book flights that arrive in the morning of your first day or fly in the day before and spend a night in gorgeous Corfu Town. Similarly, for the return leg, we recommend you book a late afternoon/evening flight or fly out the day after leaving the villa. Armonia sits above the bay and peninsula of Mongonissi at the southern tip of Paxos. At the bottom of the road leading to the villa is a small pebbly beach, while a short walk over to Mongonissi will take you to Paxos' only sandy beach, popular with families thanks to the many facilities, including a lido, watersports and a taverna. A 10-minute drive north will take you up to Gaios, with its seafront tavernas, shops, cafés, beach and boat hire opportunities. Gaios is the port of entry and departure, and also has frequent boat services to Corfu and Paxos' tiny sister island, Antipaxos. The picturesque little ports of Lakka and Laggos in the northern part of the island are also worth a visit either by car or by boat. Paxos (measuring around 13km from north to south) is situated 15km south of Corfu and about 20km off the Greek mainland. It boasts some of the most stunning beaches anywhere in the Mediterranean and, as it's only accessible by ferry, has managed to remain relatively unspoilt by mass tourism. The western seaboard of Paxos is dramatic, with cliffs, sea caves and stretches of rugged, rocky coastline, while the east coast is home to gentle sandy beaches and views of the Greek mainland. The hinterland is carpeted with olive groves, which produce some truly excellent oil. A holiday on Paxos is all about relaxing and taking it easy, all the more so if you book one of our villas on the island. Find out more about travel to/from Paxos and about getting around while you're there. Nearest beach: a small beach is a 2-minute walk below the house, while the beach of Mongonissi is 1km away (a 15-minute walk). There are several other small beaches on the coast heading towards Gaios, all within a few minutes drive. Armonia gets a 5 out of 5. Fantastic views! Armonia was lovely and the view amazing. Fantastic for two people. Armonia was an exceptional villa. It had every mod con we could want, but also the seclusion and romance of its setting. The outdoor barbeque and seating area was a great feature and our host made sure our every whim was catered to. The best summary I can give is to say we are very keen to come back next year to Armonia, and to Paxos. Armonia is nice and new, it is well equipped and very comfortable. The views are beautiful. We really enjoyed our stay.